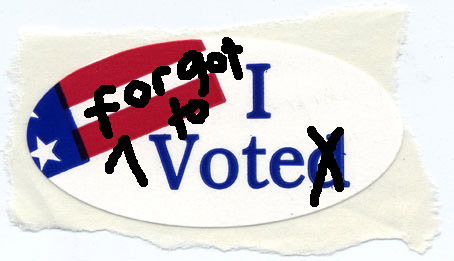 I remembered there were City Council elections today in DC...as I was on the bus on the way to work and saw someone's little "I voted" sticker. I vote--somewhat religiously. I feel it's important that when people went through so much effort to get me that right, that I should exercise it. So, I was a little distraught. The truth is that I didn't even know who was running. I just looked it up online, and it looks like there were a bunch of uncontesteds, and no one from my Ward, so I feel a little better. But, I probably would have gone anyway. On other civic matters, I was finally called for jury duty. For those of you not in DC, this is not an abnormal event for DC residents--there are so few residents and even fewer who can serve, what with the criminal records. At any rate, it's September 24. Not great timing--I have an opera ticket for that night. I have visions of Twelve Angry Men where I'm trying to convict someone of murder just so I can make the 7:30 curtain: "Oh, of COURSE he's guilty..just look at him...let's go." PS--I don't know what the f- is going on with my posts and the font. I've about had it w/ Typepad.